LINCANG, Yunnan, China, Jan. 16, 2018 /Christian Newswire/ -- A court in Lincang, located in China's southern Yunnan province, handed a group of church attendees lengthy prison sentences for supposed cult activity, despite their denials of belonging to the sect. Upon hearing their verdict, Ju Dianhong and Liang Qin expressed their dissatisfaction with their respective 13 and 10-year sentences and vowed to appeal with the help of their lawyer, Xiao Yunyang. Ju emphasized that she had never heard of the Three Grades of Servants, the religious sect under which the authorities accused her of leading, recruiting members, doing missionary work, and spreading news of the apocalypse; nor did she know the definition of the word "cult." She said she only believed in and preached about Jesus, never harming anyone or acting contrary to biblical principles. Their fellow church members Zhang Hongyan, Zi Huimei, Yang Shunxiang, and Zhang Shaocai, received sentences varying from four to eight years in length for the same charges. However, this case is not an isolated event. In March 2016, the Yunnan government formulated an investigative team that eventually carried out a coordinated attack against the Three Grades of Servants organization, which it views as a dangerous cult, on Oct. 21, 2016. Officials then utilized this campaign to round up an estimated 200 Christians across the province, falsely accusing them of participating in the cult. Many of them are still in custody, some serving similarly lengthy sentences and others awaiting prosecution. Just recently, Yunnan authorities notified their lawyers that they were suspected of "illegally" defending their clients and that their qualifications would come under official review. 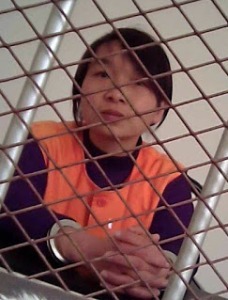 One of the still-imprisoned Christians, Tu Yan (pictured above), awaits her trial from a prison cell in Dali, Yunnan. She and her Christian friend, Su Min, ran a hotel in Dali before they were both arrested. Tu was indicted for "utilizing cults to undermine law enforcement," a charge commonly given to the Christians caught up in the crackdown. Her case is currently at the local court, which is expected to schedule a trial. Her sister, Tu Kui, said, "I panicked after hearing [about the sentencing of the Lincang Christians]. What is going on? They were sentenced so harshly. They neither robbed nor stole." "This is a historical, massive case of pure religious persecution against peaceful, independent house church Christians," said ChinaAid President Bob Fu. "The large number of arbitrary arrests and extremely harsh, long sentences imposed on these young church leaders under the guise of being 'anti-evil cult' shows that [Chinese President] Xi's regime has no interest in respecting its citizens' freedom of religion or belief. The threat against these accused church leaders' lawyers denies the basic elements of rule of law. We call upon the Chinese leaders to immediately release these leaders and make proper amends to those who have been arbitrarily detained and tortured." ChinaAid exposes abuses, such as those enacted against Christians in Yunnan, in order to stand in solidarity with persecuted church members and promote religious freedom, human rights, and rule of law.